As you may not already know…. According to several sources I checked out,almost four million men and women have thus far died or been wounded in combat while serving in the U.S. military. The American Civil War (1861-1865) remains the deadliest(750,000) followed by World War Two (405,000 during the years 1941-1945). Many Americans observe Memorial Day by visiting cemeteries or memorials, holding family gatherings and participating in parades. Unofficially, it marks the beginning of the summer season. To learn much more about this national holiday, please click here. 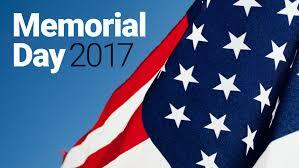 This weekend, let’s remember with gratitude our debt to so many brave men and women.